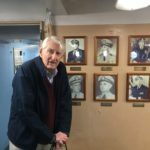 Tim Wooldridge, the son of Captain Edmund T. Wooldridge, the Commanding Officer of USS New Jersey during the later part of WWII, toured the Battleship with is wife last week. Mr. Woolridge, the former Executive Officer aboard the USS Forrestal, visited from Annapolis, MD. Kids can enjoy free marshmallow PEEPS today with a tour of the Battleship New Jersey for #Easter Weekend! The Peeps are available in the ship’s Gift Shop Saturday, Easter Sunday and Monday, April 2, while supplies last. 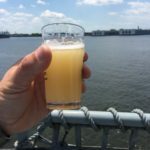 Save The Dates for Beer Festivals on the Battleship! Due to the snow storm, the Battleship is closed for tours on Thursday, March 22. The Twilight Tour scheduled for 6pm on March 22 has also been cancelled. 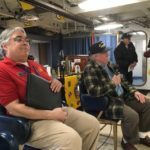 The Battleship will be open for , March 23 from 9:30am to 3pm. Due to snow and sleet today, Tuesday, March 20, the Battleship will close for tours at 1:45pm. 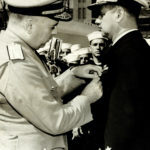 The Battleship will also be closed for tours on Wednesday, March 21. 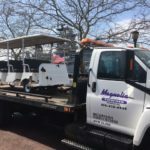 Magnolia Towing picked up two tram cars from the Battleship New Jersey Museum and Memorial and will bring them to Somerdale Collision, where they will be repainted. 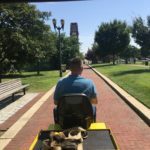 Look for the trams to transport guests along the #CamdenWaterfront this spring! 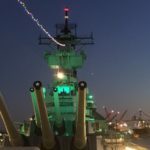 Wear your green to the Battleship New Jersey this Saturday and Sunday for St. Patrick’s Day and save 20% on a Fire Power Tour! The ship is open for tours every day from 9:30am to 3pm.